As is so often the case, Jesus is speaking on multiple levels. Physical and Spiritual. Confusion ensues. Jesus miraculous deeds are always for two purposes: To rectify a human need, and to reveal who he is. If you dwell only on one, and not the other, you’re missing the full point. All good things come from God- not from the messengers of God. It is not Moses who saves the Israelites, but God. It was not Jesus who provided the bread and fish, but God. God gives even faith, and it is this faith that is the key. God continues to give. The story of God providing is not just one for the histories. It is one for the present age. It is not that God gave, but that God gives. Same verb used to wonder where the wine from Cana came from (2:9), where the “birth from above” comes from (3:3, 7), and where the living water comes from (4:11). J: Wrong bread - that was just manna, God will give you the bread of life that gives life to the world! Crowds: Eternal bread! Food forever?! Count us in! J: You don’t get it. Not bread you can eat that will grant you physical life, but bread that will feed your soul. Are we any different? No matter how much we receive we always are wanting more. What have you done for me lately? How often do we come to church looking for the wrong thing? How often as a church do we look to provide the wrong thing? O Benjamin Sparks, “We are accustomed to inviting people into the community of faith for all the wrong reasons: for the "right" kind of worship; for political engagement on behalf of the poor and downtrodden; for the sake of a Christian America; for a strong youth and family ministry; for the opportunity to practice mission in a downtown location, or to go on mission trips to Africa or Central America. Yet what we have to offer—in Christ and by Christ and because of Christ—first and foremost is "soul food," which lasts forever and does not change with the changing circumstances of the church or the world. It is soul food that we desire, and soul food in which we will rejoice, long after our bellies are full of rice and our lives know justice in a free society.” Feasting on the Word – Year B, Volume 3: Pentecost and Season After Pentecost 1 (Propers 3-16). Jesus refuses to participate in their quid pro quo, consumer focused system. He isn’t interested in being their king (cf. 6:15), but in revealing a new way, a radical truth and a full life. How much of Christianity is based on a desire of immortality? Endless food, endless blessing, endless life? Jesus is more concerned with this life - food that will grant quality of life in relationship with God- NOT neverending sustenance. Do we really want the bread of life? Do we desire a deeper relationship with self, other and God or are well looking for eternal life and possessions? “You, eternal Trinity, are Table and Food and Waiter for us.” (Catherine of Siena, as quoted on page 91 of Wearing God, by Lauren Winner). If Jesus is the “bread of life,” what kind of bread is he? What kind of bread do we use at Communion? God is the meal and also provides the meal. 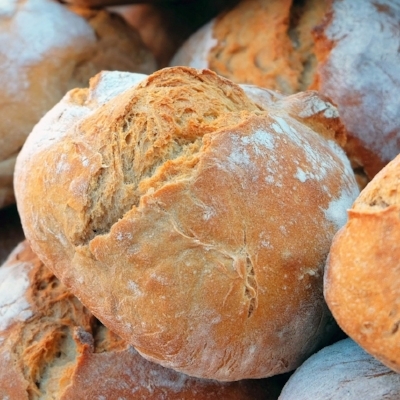 White bread was once a delicacy because highly refined flour was expensive. 1890: 90% of bread eaten in the US was made by women at home. 1930: 90 % of bread was baked outside the home by men in factories. As it became easier to produce, it became more popular. Not always because of its taste. Created by women for the men in segregated South who would be traveling far for work, or for families from the North traveling into the South to visit family. They would not be able to stop anywhere and eat. Food must be packed that could last for hours. Avoiding the bread of Communion as a part of an eating disorder is an extreme case, but probably one many people can identify. Maybe they haven’t gone that far, but they can see it as plausible. Obsessing over food, we have lost the joy, process, and fellowship of it. Too much of eating food has been reduced to mechanical process, fast, quick, and cheap. Yet, God is surely in the cold can of Spaghetti-O’s with the TV on or the Quarter Pounder woofed down in the car. Sometimes we just miss it. Ahh….sweet hypocritical self-righteousness, goes down smooth every time...except this time. Last time Nathan spoke to David was to tell him God would watch over him and his house and make his name great. What about when we don’t want God watching over us? Is this a theological device to explain how such a horrific thing to happen to God’s chosen? Psychological and family systems would suggest this to some extent, but interpreting this as the will of God is dangerous and I do not think faithful theology. We have to imagine what Bathsheba is feeling in the midst of this- this could make a powerful sermon about her response, grief, victimization, etc. God watching over us can be both challenging and comforting. We love that notion when we are afraid but what about when we are arrogant? How do we interpret when bad things happen to children? Infant mortality, disability, stillbirths, etc. How do we comfort the parents without adding to their own grief and guilt? Forgiveness is complex. At times we hear forgive and forget (“I will remember their sins no more”) but then we also have instances of God’s forgiveness paired with God’s judgment. How to we affirm that there are just consequences for our actions and proclaim God’s boundless love and grace? “Therefore” pushes us to review last week. Paul is making a statement here based on what came before. Living within God’s victory means something. This begins the “So what?” section of Paul’s letter. He went low so that all could be brought up. No one is ‘above’ getting dirty if Jesus was willing to. Common “calledness” of all believers. God calls us all to a life of wholeness. All related, but slightly different. Much could be made of these five roles. Unfortunately, the Church seems to have rolled all of these into one - Ordained, Professional Clergy. Equip the saints… until we all reach the unity of faith and knowledge of God’s Son. Growth is the goal of Christian faith. God wants us to mature - to move somewhere, to grow. This is not about ecstatic conversion and enthusiastic experience. This is about a life of moving toward God - sanctifying grace over time. An integral part of ‘building up’ the church, of course, is bringing about and maintaining its unity. Any disunity is evidence that the church is immature. Careful though, because it is easy to see others as causing the disunity, and they are immature. Clergy must take some blame for allowing the roles of apostle, prophet, evangelist, pastor, and teacher all into the one professional leader - or at some churches a multi-staff operation of trained professionals. The Clergy Guild at the same time laments that lay people aren’t more of these roles, but also have helped create a system in which the professionals are rewarded for doing these things, but we are to “equip the saints.” for this ministry, not simply keep it to ourselves. Clergy must be identifying leaders. People cannot become mature adults unless those who are mature help them become independent. His sons- like David – will use people and take what they desire without regard to justice or consequence. David will never again achieve greatness due to the consequences of his actions. Not the biological transmission of sin, but the acknowledgment that humans are, by their very nature, sinful. Recognition of a deep and complete sin which was rebellious, has bent David’s relationship with God “out of shape” and how deeply David’ action shave missed the mark. Only God has the power to clean the relationship and David himself. The goal of the Psalmist is to be back in right relationship – NOT to escape consequences.